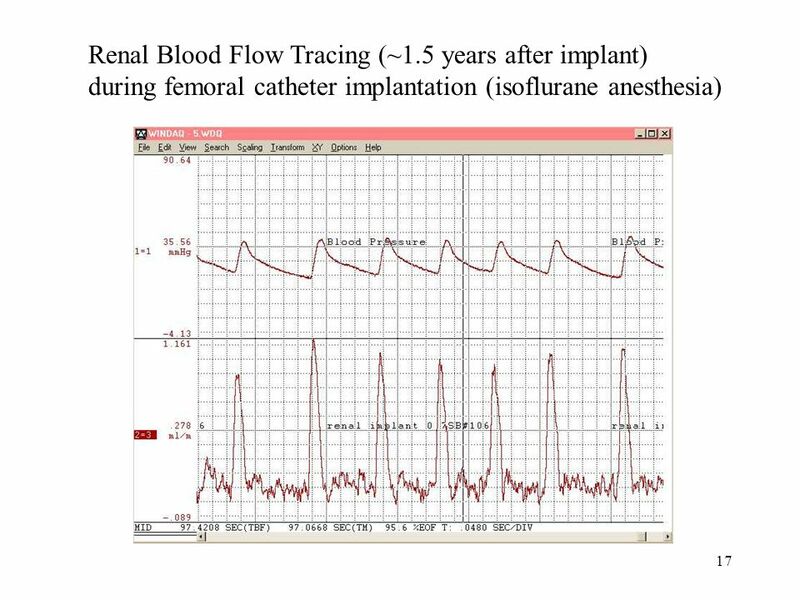 1 Measurement of Renal Arterial Blood Flow in the Mouse Protocol: Implantation of the Transonic 0.5 mm Flowprobe on the Renal Artery Acute & Chronic Considerations. 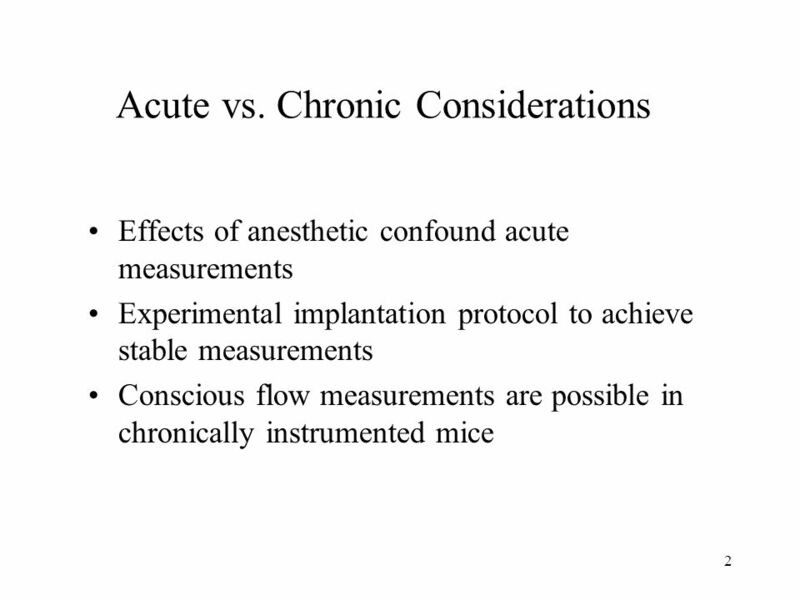 1 1 Measurement of Renal Arterial Blood Flow in the Mouse Protocol: Implantation of the Transonic 0.5 mm Flowprobe on the Renal Artery Acute & Chronic Considerations Measurement Data Equipment References Transonic Systems Inc.
3 3 The mouse is prepared for renal flowprobe implantation in the prone position The mouse is anesthetized with a mixture of ketamine:xylazine (50:10 mg/kg), shaved and the surgical site prepared with Betadine. Note: the midscapular area is also prepared for exteriorizing the probe connector. The mouse is placed on a warming pad to maintain core temperature. 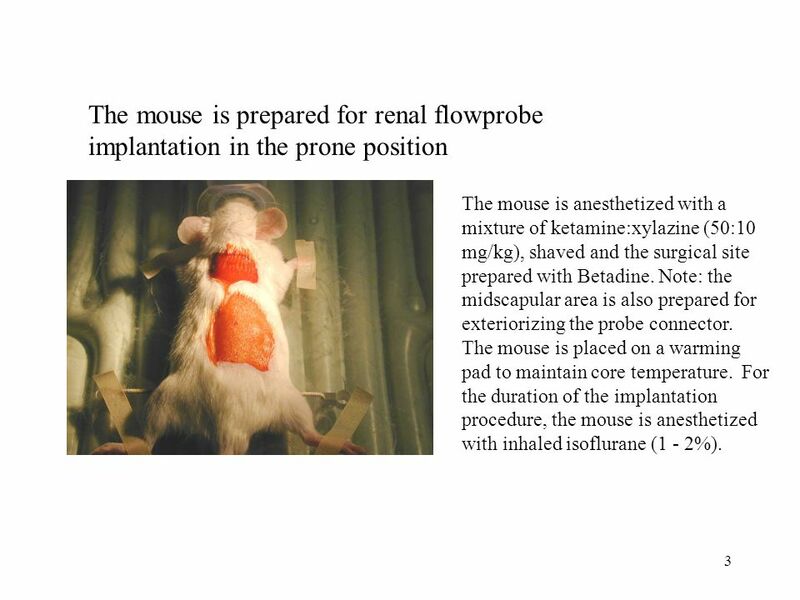 For the duration of the implantation procedure, the mouse is anesthetized with inhaled isoflurane (1 - 2%). 4 4 Make the initial incision 1 cm lateral to midline of the back. Cut through the skeletal muscle to the hylus of the kidney. 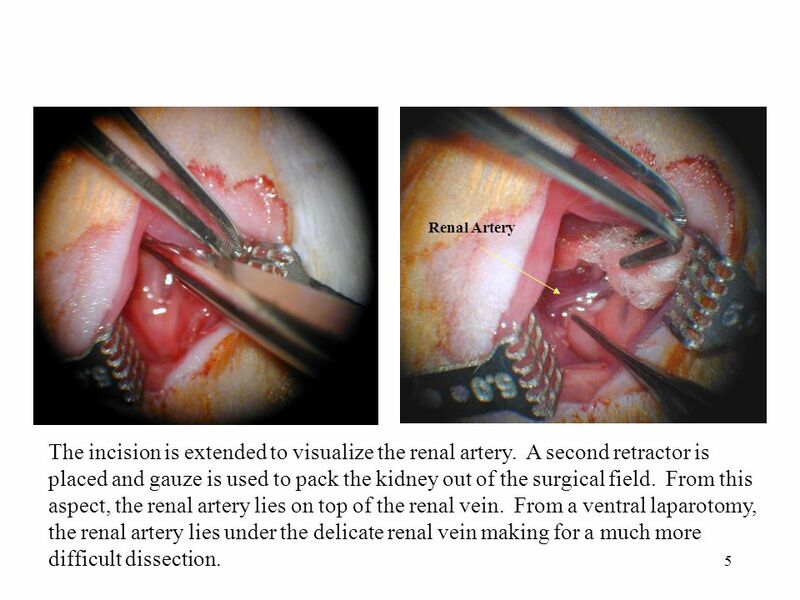 A miniature retractor (Fine Science Tools) is placed at the base of the incision revealing the kidney beneath the muscle layer. 6 6 Renal artery length varies and is often too short between branches to accommodate early V-probe designs. This specimen measures approximately 1.75 mm between branches with adequate length for the 0.5PSB flowprobe. 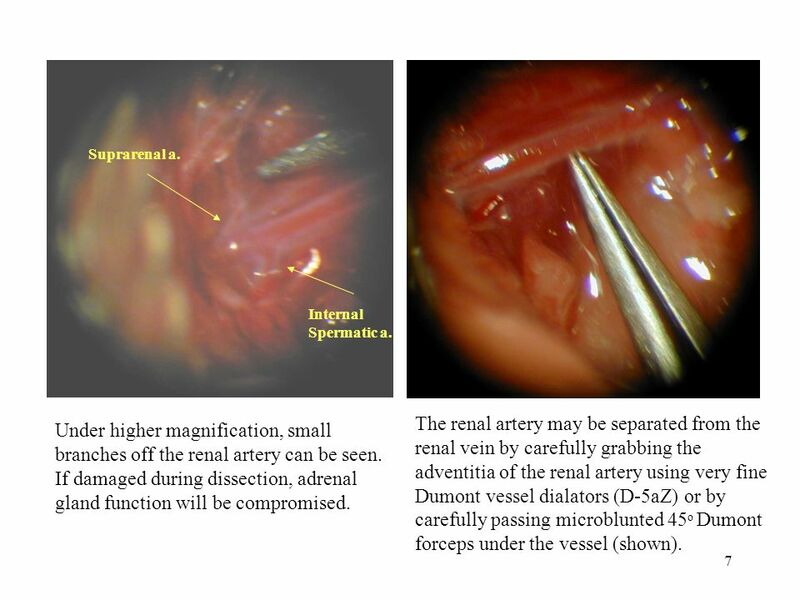 Magnification is increased; the renal artery measures 0.35 mm diameter on a micrometer. Note the nerve below the artery. 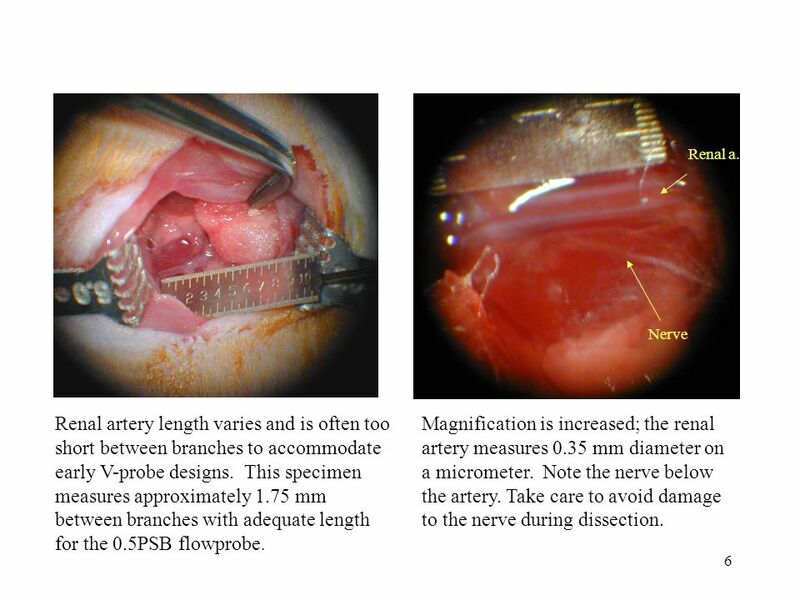 Take care to avoid damage to the nerve during dissection. Nerve Renal a. 7 7 The renal artery may be separated from the renal vein by carefully grabbing the adventitia of the renal artery using very fine Dumont vessel dialators (D-5aZ) or by carefully passing microblunted 45 o Dumont forceps under the vessel (shown). Under higher magnification, small branches off the renal artery can be seen. If damaged during dissection, adrenal gland function will be compromised. Suprarenal a. Internal Spermatic a. 8 8 Renal artery dissections are best performed by applying slight pressure against the renal a. and allowing the 45 o Dumont forceps to spread and dissect the adventitia away from the artery itself. Do not apply any kind of dissecting force against the renal vein. 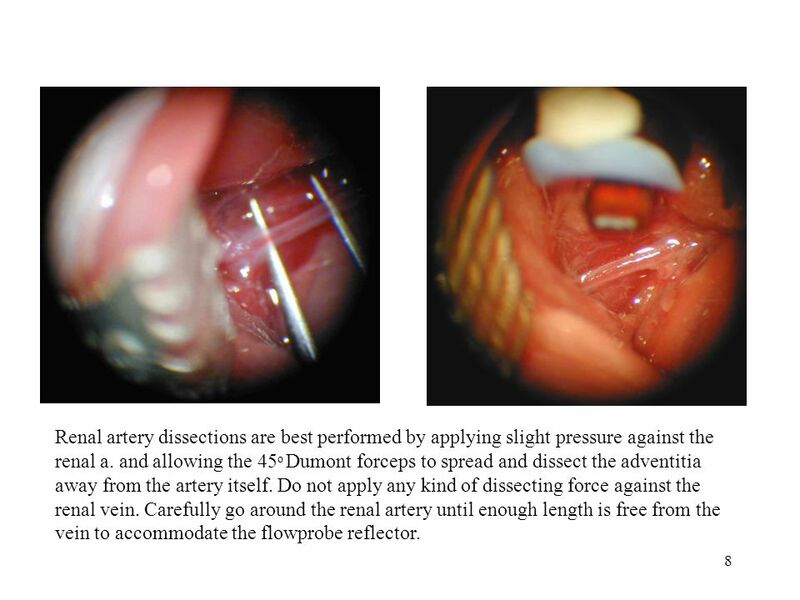 Carefully go around the renal artery until enough length is free from the vein to accommodate the flowprobe reflector. 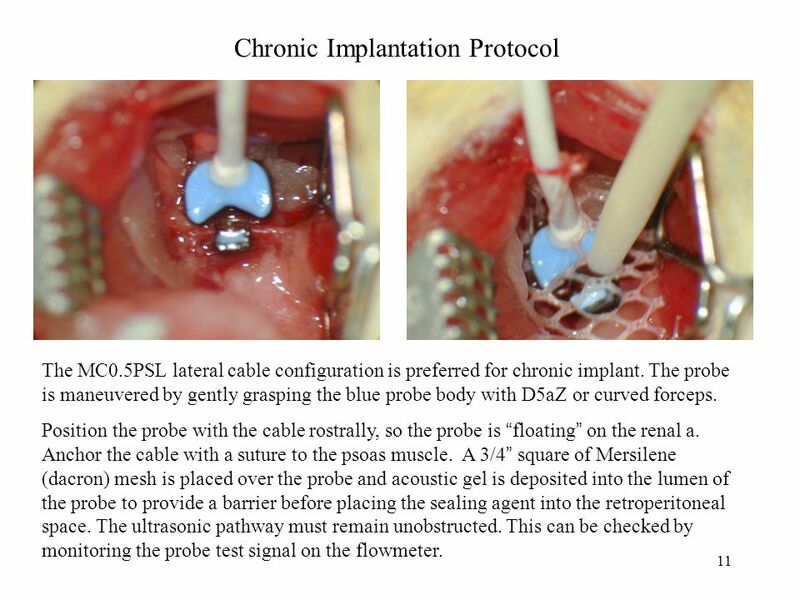 11 11 Chronic Implantation Protocol The MC0.5PSL lateral cable configuration is preferred for chronic implant. 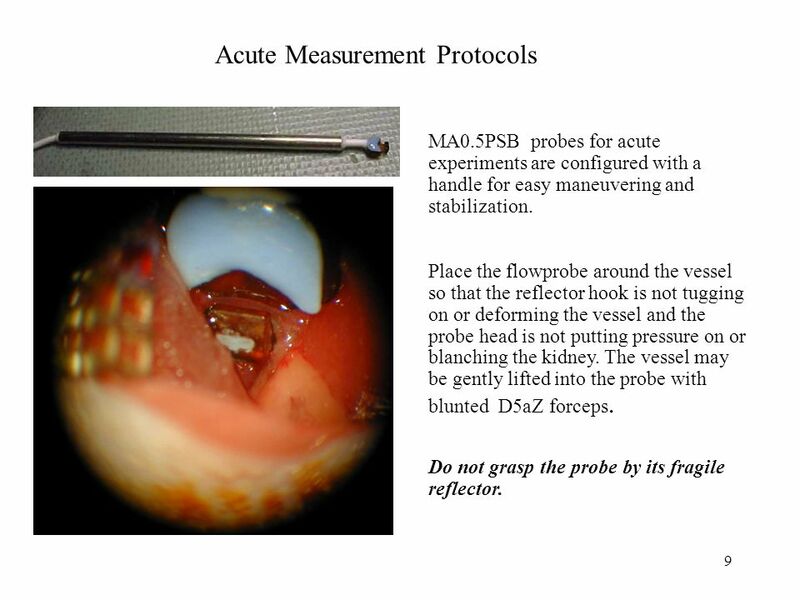 The probe is maneuvered by gently grasping the blue probe body with D5aZ or curved forceps. Position the probe with the cable rostrally, so the probe is floating on the renal a. Anchor the cable with a suture to the psoas muscle. A 3/4 square of Mersilene (dacron) mesh is placed over the probe and acoustic gel is deposited into the lumen of the probe to provide a barrier before placing the sealing agent into the retroperitoneal space. 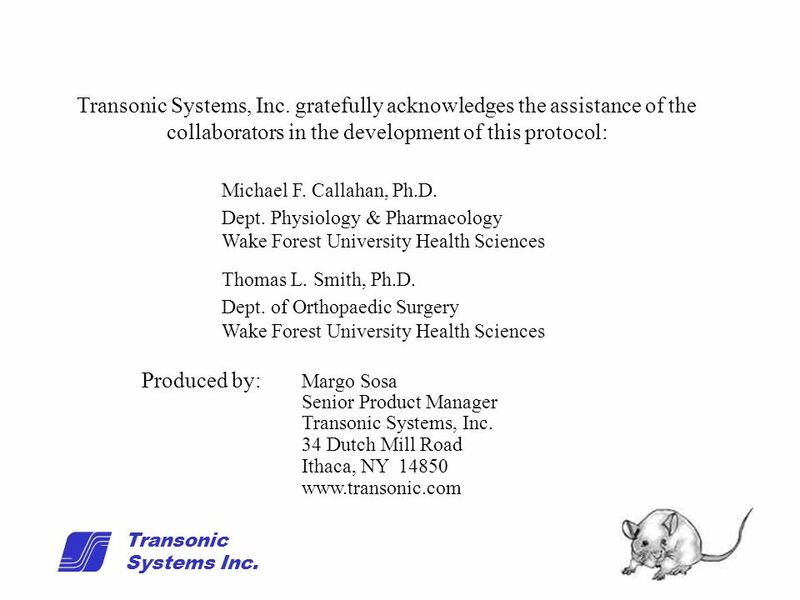 The ultrasonic pathway must remain unobstructed. 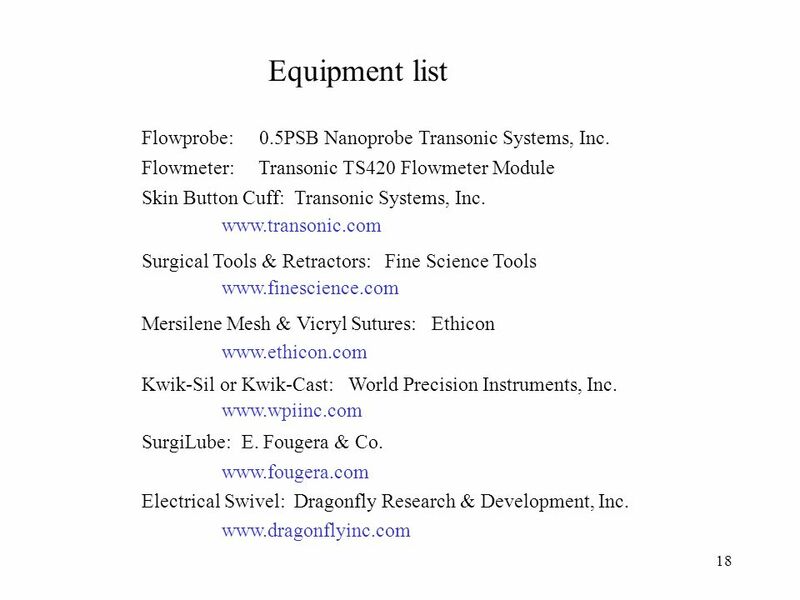 This can be checked by monitoring the probe test signal on the flowmeter. 13 13 Allow the cast to become hardened before moving the tissues. Anchor the probe cable to the psoas major muscle with 5-0 Vicryl suture. 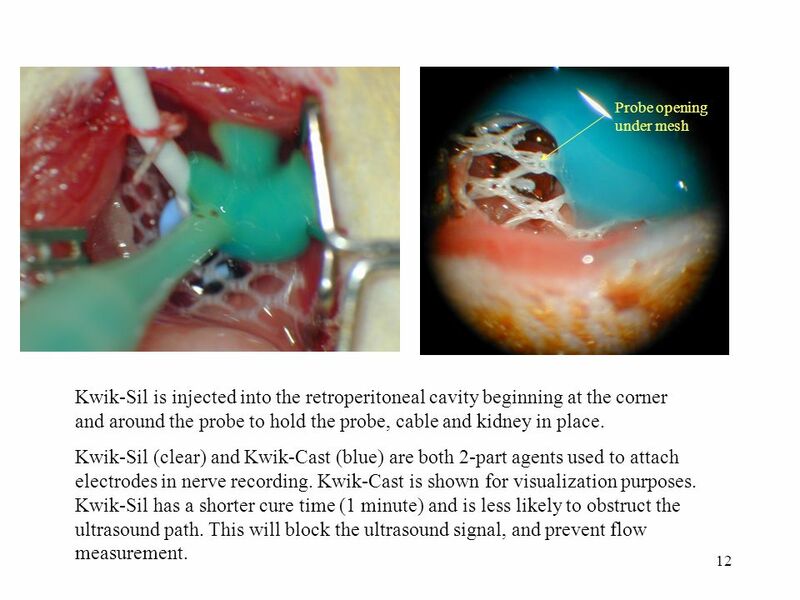 Continue to close the skeletal muscles over the renal flowprobe preparation. 14 14 Close the skin over the incision with 5-0 Vicryl sutures. 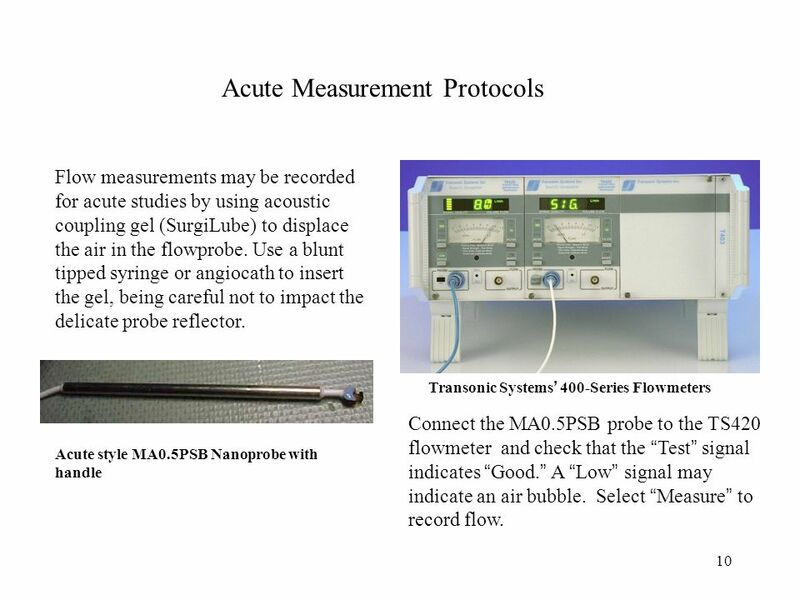 The flowprobe maintains the best position if the cable is not disturbed during subcutaneous preparation. To do this, cut and close the skin over the cable to the probe connector at the midscapular region, leaving the probe s CA4 connector exposed. 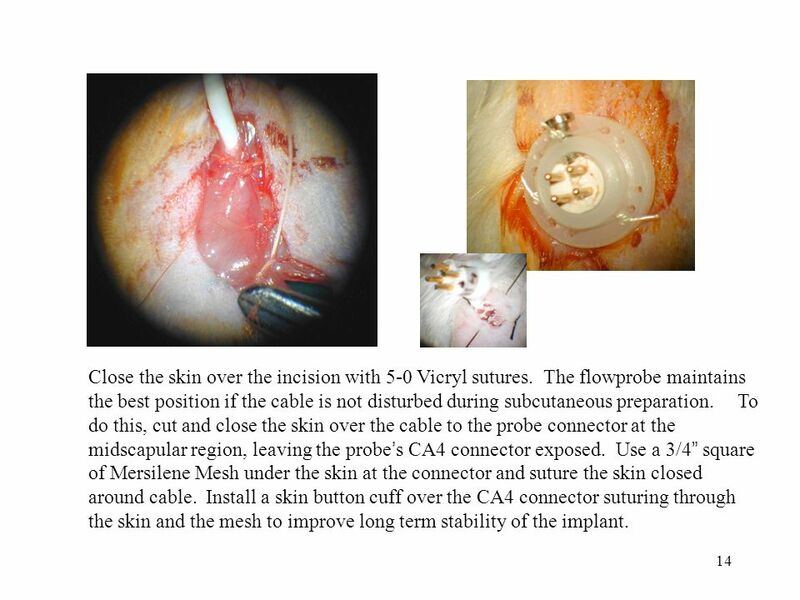 Use a 3/4 square of Mersilene Mesh under the skin at the connector and suture the skin closed around cable. Install a skin button cuff over the CA4 connector suturing through the skin and the mesh to improve long term stability of the implant. 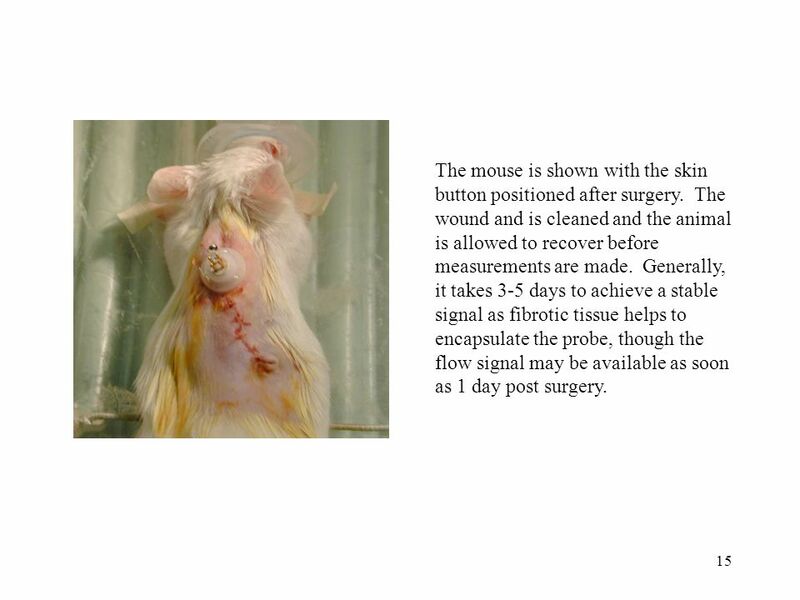 15 15 The mouse is shown with the skin button positioned after surgery. The wound and is cleaned and the animal is allowed to recover before measurements are made. Generally, it takes 3-5 days to achieve a stable signal as fibrotic tissue helps to encapsulate the probe, though the flow signal may be available as soon as 1 day post surgery. 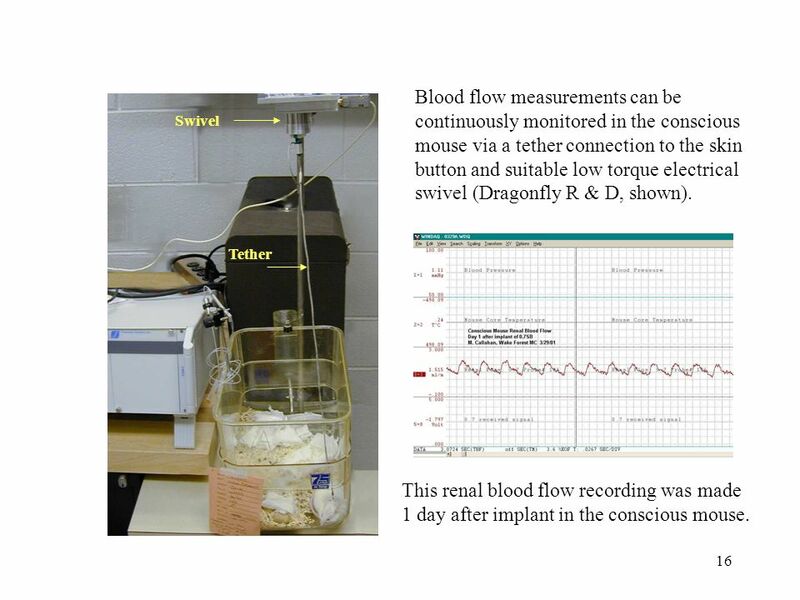 16 16 Blood flow measurements can be continuously monitored in the conscious mouse via a tether connection to the skin button and suitable low torque electrical swivel (Dragonfly R & D, shown). Swivel Tether This renal blood flow recording was made 1 day after implant in the conscious mouse. 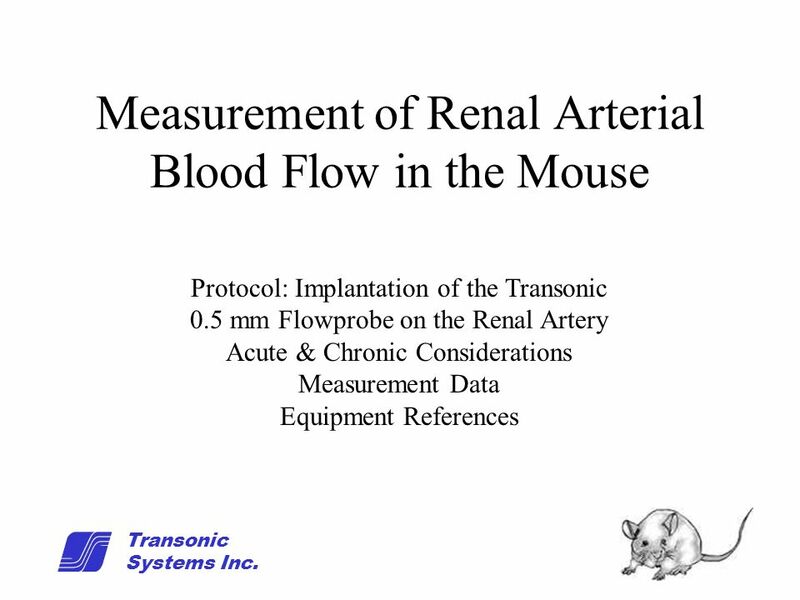 Download ppt "1 Measurement of Renal Arterial Blood Flow in the Mouse Protocol: Implantation of the Transonic 0.5 mm Flowprobe on the Renal Artery Acute & Chronic Considerations." Rodent Surgery Course Why???? Laws and regulations dictate appropriate procedures and care. Optimizing Tissue Collection for PD Assays Using Non-Clinical Models Melinda Hollingshead, DVM, PhD. Smart heat for comfort and safety 1 Self-regulating system to maintain water flow in gutters and downpipes. Dorsal Slit Method Chapter 5: Surgical Procedures for Adults and Adolescents35. 1 Sono Facts. 2 What makes up the “Sea Gull” sign? REGULATION OF RESPIRATION. Theory Preparations before operation Operation in neck Item outline.